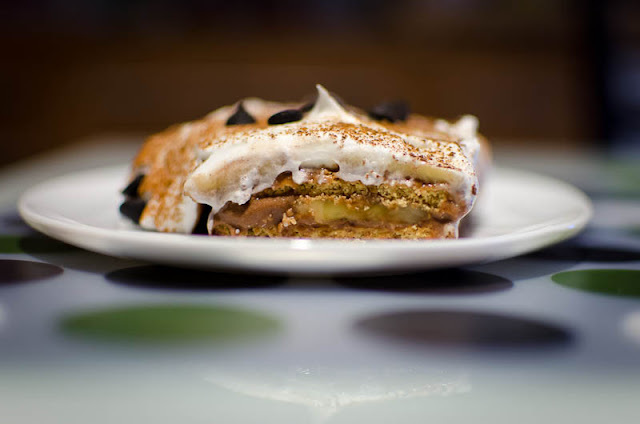 This cake was made with graham crackers, chocolate pudding, whipped cream and ripe bananas. Layer the bottom of a pan with the graham crackers; add a layer of smashed ripe bananas and then a layer of chocolate pudding. Repeat layers and cover with a final layer of whipped cream. Let stand in the freezer for a few hours. The graham crackers will absorb the moisture and change to a texture similar to cake.